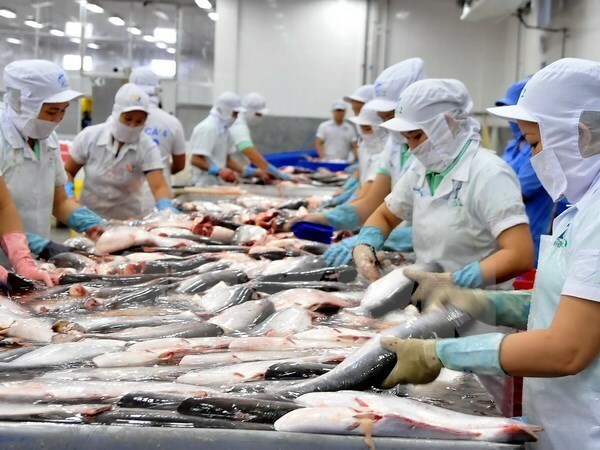 Hanoi (VNA) — Vietnam’s tra fish exports to the United States have remained stable after it imposed a demand that exporting countries demonstrate their food safety control system is equivalent to that of the US. An announcement to this effect by the Vietnam Association of Seafood Exporters and Producers (VASEP) on August 17 has belied fears and reports that exports of the fish could be rejected or cancelled in the coming time. Reports of rejection or cancellation of Vietnamese tra fish exports “has no basis,” VASEP said in a note. It said that tra fish exports to the US had declined in the first quarter due to a shortage of raw materials, but recovered in the second quarter with an 8.4 percent increase, thanks to rising demand and increase in supply of raw material. VASEP General Secretary Truong Dinh Hoe said while the equivalence process was not yet completed, it was prudent not to assume any possibility of Vietnam not passing such determination or speculate on suspension of ongoing exports. “During the 18-month transitional period, both sides have worked out cooperative approaches to common issues in question and US Food Safety and Inspection Service (FSIS) has also given close guidance on how to comply with its requirements,” Hoe said. He also said that while Vietnam’s tra fish industry has well developed with substantial and stringent food safety control system, he is concerned that an import discrimination policy by the US government may cause unfavourable and unfair decisions against Vietnam. “VASEP hopes that there will be solutions reached by the two governments not to disrupt free trade between the two countries,” the note said. In early July, the FSIS had announced that it would apply new import regulations for Siluriformes fish from August 2, instead of September 1 as stated earlier. Under the regulations, authorised agencies in the exporting country must submit to the FSIS documents to prove that its food safety control system is equivalent to that of the US. On August 15, the Ministry of Agriculture and Rural Development (MARD) launched Siluriformes Controlling Programme designed for Siluriformes fish and related products exported to the US market. The programme aims to demonstrate equivalence and minimise rejection of fish batches exported to the US, thus reducing costs for enterprises. Starting from September 1, 2017, the programme will apply strict supervision on all stages of fish farming, processing and exporting. Qualified products must satisfy 85 criteria of the US regarding veterinary medicine, 106 criteria on pesticides, four on dyeing chemicals, 17 on metals and eight in biochemistry. In case a fish batch attracts warnings from an authorised US agency, NAFIQAD will request the seafood processor to trace its origin and investigate why it failed to meet food safety requirements. The department will also halt the concerned facility’s Siluriformes fish export to the US, while handling its violations.